At River Valley Dental, we want to help each of our patients love their smiles. For patients experiencing tooth loss, Dr. Gojgini offers treatment to help restore your natural-looking, comfortable smile with dental implants. Are you missing one or all of your teeth? Regular flossing, brushing, and preventive checkups allow some people to maintain their natural smiles for a lifetime. However, sometimes our teeth just can’t keep up with our busy lifestyles! Modern tooth restoration has never been better! 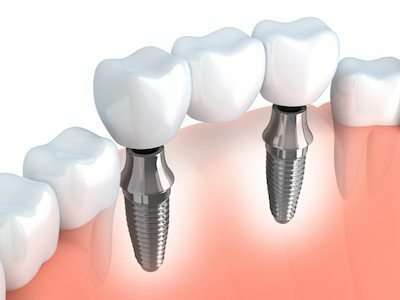 Using a titanium post, a dental implant acts as an artificial “tooth root”, providing a secure support to permanently anchor your new tooth, bridge or denture. What Are Full Arch Bridges? After a consultation with Dr. Gojgini, we can place full arch bridges, which are a lasting solution for patients in need of a full mouth restoration. Full arch bridges are an option for our patients who do not want to wear traditional dentures. We achieve permanent tooth replacement through a series of dental implants on both the top arch and bottom arch. Using expert technology, Dr. Goigini can restore your smile and renew your confidence! Schedule Your Dental Implant Consultation With River Valley Dental Today! If you have a question about dental implants, tooth pain, or any other services at River Valley Dental, give our office a call. A consultation with Dr. Gojgini is the perfect way to answer all of your questions and determine if dental implants could be the best solution for your smile! Restorative dentistry can repair and restore the natural look of your smile. With restorative dentistry treatments, you can smile with confidence again!